Marie France Van Damme Brings Her Designs to Wynn Plaza. Thrill seekers, rejoice! 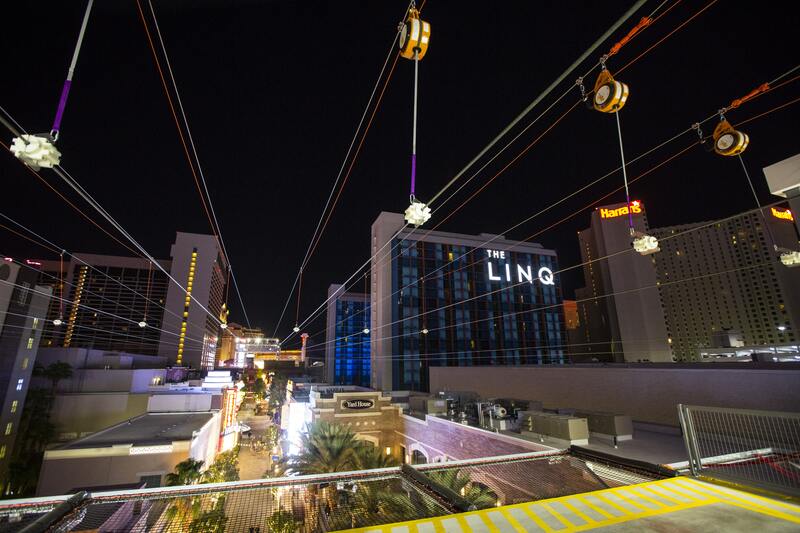 Fly Linq, the first and only zipline on the Strip developed by the team behind High Roller, the world’s tallest observation wheel, opens this week with 10 1,121 feet long side-by-side zip lines. The open-air ride stretches from The Vortex at The Linq to the top of the 114-foot-tall tower above The Linq Promenade. Guests can enjoy a spectacular view of the Strip as they arrive at the launch tower; a special elevator ride was crafted for riders to get a sweeping view of Sin City. After strapping on some gear-fitted harnesses, guests can choose to ride the zipline in either a seated or “superhero” position. Photos are available for purchase after riders land safely near the base of the High Roller.